It’s no secret Ford is both proud and excited for its very first electric passenger car. The 2012 Ford Focus is currently on its way to select dealerships across the U.S. and will mark the company’s first foray into the modern EV market (and no, we’re not counting hybrids). We recently had a chance to take the Focus Electric for spin on the rain-soaked streets of Portland, Oregon, and our initial drive impressions were, well, impressive to say the least. That is, so long as you don’t think about its gasoline counterpart. In fact, you’d be hard-pressed to spot the differences between the two, but they do exist. Truth be told, the Focus Electric is as slick as they come. We already enjoyed the visual flair of our recently reviewed 2012 Focus SEL hatchback and that winning aesthetic carries over well to the electric-powered version. The only major differences to the design, apart from the electric badging in and around the vehicle, is the front end’s decidedly Aston-Martin-like grille, a front charging port on the driver’s side, and more aerodynamic front fascia. Otherwise, it’s a rather incognito EV, which will bode well for those that simply don’t want to drive some of the more “eccentric” electric cars on the market. 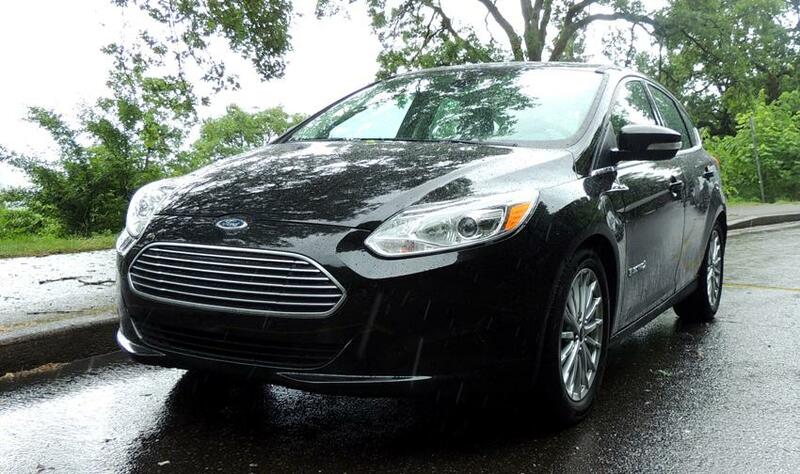 The standard Focus features a comfortable cabin experience and the electric version is no different. In fact, other than the reworked instrument panel – which nestles the car’s speedometer in between two LCD displays — the differences remain minimal, which isn’t a bad thing by any means. Front and center is the eight-inch My Ford Touch screen, which comes standard on the Focus Electric. Sadly, it’s still as irritating as ever. Other than that, most of what we saw inside the Focus Electric comes standard on the vehicle. The only options Ford tells us customers will be able to add are two new paint colors: Blue Candy for $395 and White Platinum for $495. Standard models feature cloth bucket seats (partially made from recycled materials like plastic bottles), but those more discerning over their in-car upholstery can opt for leather interior for an added $995. All in all, the cabin experience was cozy and everything felt perfectly placed. In addition to its snazzy design, dazzling displays, and comfortable cabin, the Ford Focus Electric also boasts some impressive range figures. 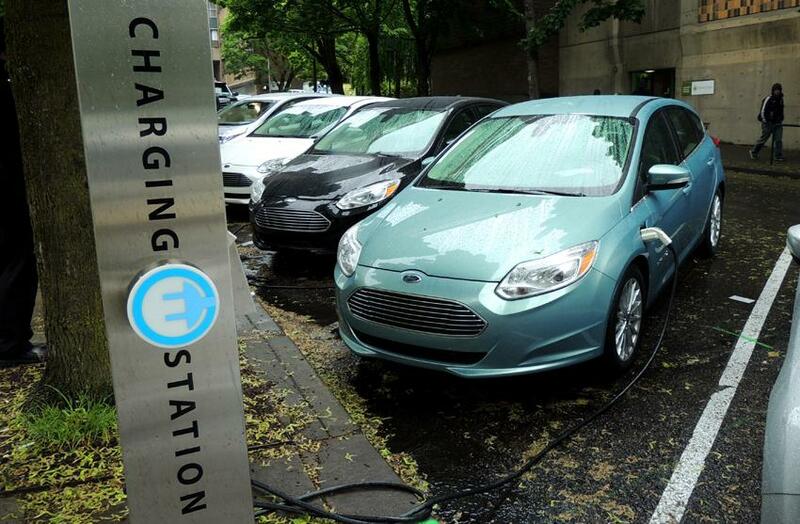 The EPA has no doubt pleased the Ford camp by awarding the Focus Electric with a 110 MPGe highway rating, 99 MPGe in the city rating, and a 105 combined miles per gallon equivalent. 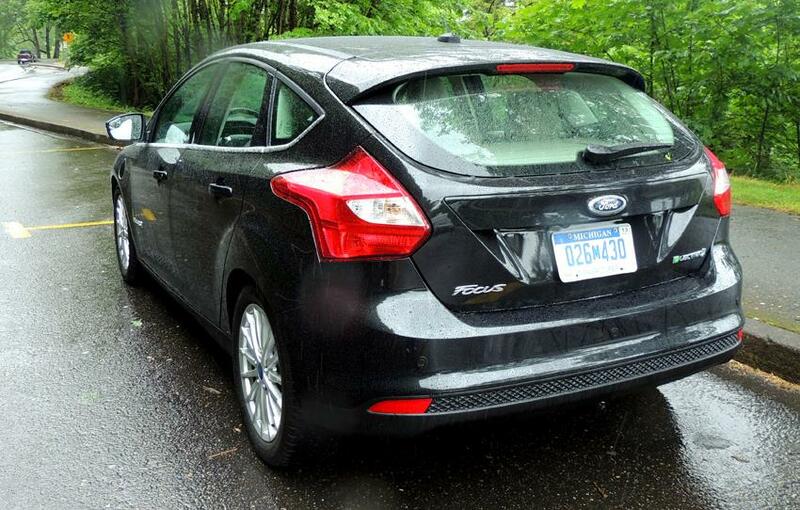 Under optimal driving conditions, Ford says the Focus’s total electric range is 80 miles. Of course charging times are just as important and Ford has been quick to elevate itself over EV rival Nissan when it comes to vehicle charging. As it stands, the Focus wins this battle. It is twice as powerful as the Leaf and is able to fully recharge the car’s electric battery in as little as four hours from a 240-volt Level 2 charging station (120-volt Level 1 charging stations will drag that time out to 20 hours). Most electric vehicles available today aren’t exactly speed demons and the Focus Electric is no different. Powering the Focus’ electric motor is a 23-kWh lithium-ion battery capable of producing 141 horsepower and 188 pound feet of torque. Maximum speed tops out around 84 mph, which isn’t spectacular, but it’s definitely nice having all that torque available right out of the gate. We also found the brakes a little too sensitive for our liking, but we imagine in time we’d grow accustomed. It’s not until you get behind the wheel that you start to really appreciate the electrical underpinnings of the Focus Electric. Driving the car feels both smooth and effortless. While the Focus exterior does an excellent job of masking it’s electric powertrain, the Focus’s handling and dynamic driving experience make it easy to forget that the car you’re driving will never, ever require even a sip of gasoline. Like other electrics, the Focus creates virtually no noise while at stand still or in motion and emits zero carbon emissions. But while the Focus offers up a truly engaging ride and handled admirably for the majority of our quick jaunt around town, it did tend to feel rather sluggish at times, and is nowhere near as responsive as its gasoline counterpart. This mainly has to do with the Focus being forced to accommodate the heavy lithium-ion battery pack powering the car’s electric motor. Nevertheless, acceleration was responsive and quick compared to other electrics we’ve driven like the Nissan Leaf, even if its performance limitations become rather apparent when comparing it to a standard Focus. When compared to other EVs out now, the 2012 Focus Electric is a winner. It doesn’t lack for style or performance, is fun and engaging to drive, and is probably the best all-around EV on the market. But that distinction doesn’t come cheaply. If you’re an EV enthusiast that wants to get in on the scene the 2012 Focus Electric is likely your best bet – assuming money isn’t a factor. For now, it’s the sexiest, most efficient EV you’re going to get south of $60,000.